Wealden roads were notoriously bad, with low lying clay areas virtually impassable in the winter. Historically roads were the responsibility of the parish through which they ran. This was a heavy burden on small parishes with busy roads, like Marden. The introduction of Turnpike Roads, with the tolls being collected by trustees from road users to fund improvements and repairs, eased the burden on the parish. The new system came to Marden in 1760s when a Trust was formed to take over the Maidstone to Cranbrook Road via Stilebridge. In 1765 the main road through the village was turnpiked. There were three sets of Tollgates on the Turnpike Roads running from Stilebridge. 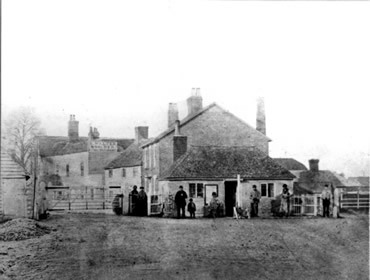 This very old photograph shows the 2 sets of tollgates covering the entrances to the Goudhurst Road and Pattenden Lane. People wishing to pass onto the Turnpike Road at these gates would need to pay the toll. One was opposite Stilebridge Farmhouse and the other two were in the village, at the junction of the Goudhurst Road and Pattenden Lane. The other was near the Unicorn, with gates across the Maidstone Road, and the road to Staplehurst. There were different rates for wagons: narrow wheeled ones had to pay a penny more than broad wheeled ones because they cut up the road more. In 3rd April 1828 an Act was passed by King George IV “for more effectually repairing and improving” the Turnpike Road. The system came to an end in the later part of the 19th century when the unwelcome Tollgates were removed and the roads were taken over by the new highways authority. However some of the milestones which were part of the Turnpike Roads remain to this day. For example the one shown here in the centre of the village showing “Marden O”. 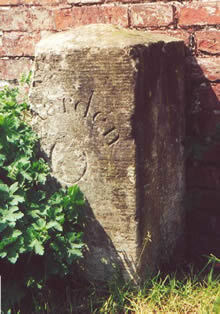 Mardens milesones are the subject of a booklet by the Marden Society History Group, see Publications.